Our family has recently begun a love affair with green juices. The inspiration came from the youngest member of our family having a slight obsession with the Spirulina smoothie from Charlie’s. We’ve recently been journeying more and more into raw food creations and green foods seemed like something wonderful to start including in our family diet. I know this is no big revelation, green juices and smoothies have been around forever, but I thought I would share with you some great combinations we have come across as well as share our enthusiasm for this very simple and yummy way to get so much goodness into our bodies. The FIG bulk fruit orders are a great (and economical) way to stock up on produce for use in smoothies and juices. Storing the produce can sometimes be a juggling act – we know that, but last bulk fruit order when I looked at two fridges overflowing with fresh food and a bulk fruit order still to be packed away, I was grateful for our 105L icebox that sits unloved for most of the year until we pack it up and head off on a long awaited camping adventure. So dust off those old eskies, squeeze a second hand fridge into that spare space in the laundry (you can always find these on the side of the road or being thrown out by some relation somewhere who is trading theirs up) and stock up at the next bulk fruit order! Here’s how you can use anything green in the bulk orders or from the abundance of nutritious, local and organic greens we are blessed to receive in our boxes each week. For wonderful raw inspiration, I always head over to Kristen’s Raw – a wealth of raw food information with wonderfully simple and tasty recipes. Kristen and hubby have just welcomed their little ‘monkey’ into their family, so her updates may be a bit less regular now, but the archived info will have you reading for years anyway. Kristen kept a wonderful online pregnancy journal about High raw food intake whilst growing a bub in the womb. Very inspiring journey. Anyway, back to all things green – Kristen’s blog is full of lots of wonderful green combinations; Plant blood, Green Juice and her Cayenne spiced green smoothie – just to name a few. If you spend some time looking around Kristen’s site, you’ll come up with a never ending list of ‘want to try’ recipes for a variety of raw foods, but also many wonderful smoothies/juices – green or otherwise. The Whole Life Nutrition Kitchen is another great recipe inspiration source, in particular (and back to subject!) 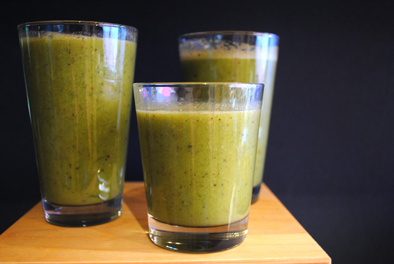 we liked their Winter Green Smoothie recipe. Ours resulted as a Winter red smoothie, because we had red cabbage on hand, not green – but that brings me to my next point…. Recipes are great for inspiration and guidance, but that is really all they are. And for something like a green smoothie, once you have followed a few recipe’s you really get the hang of various nourishing and tasty combinations. The only rule with green smoothies is; “If it’s green – chuck it in!”… and even then, if it’s not green and you still want to chuck it in… then do so. But the main aim is to have predominantly green foods in these types of juices/smoothies. In a Westernised society, we are exposed daily to environmental pollutants, free radical damage and stress level impact – it’s just a part of living in the world we do, no matter how ‘clean and green’ we try to live, this fact is a reality. The benefits of green juices and green foods are that they are extremely cleansing to the body and are full of health beneficial anti-oxidants. A major part of our common place Western diet is extremely acidifying – green juices and foods offer a beautiful alkalising balance to this. There is a really eye opening list of acid/alkaline foods on this link. If you would like to read more about the benefits of green juices, there is some nice info here, or you can just google ‘health benefits of green juices’. • If it’s green, chuck it in. This means cucumbers, celery, apples, kale, cabbage, carrot tops, spinach, rainbow chard….. and all the rest I haven’t thought of whilst typing this list! • If possible, juice with a slow juicer. Traditional style juicers that can conveniently ‘juice whole apples’ may seem like they are great, but because of the power and pressure needed to juice that whole apple, the machine and the fruit get very hot – this in turn depletes the nutrient content of the juice. Slow juicers (this link is to just one type of slow juicer available) result in a much more nutrient rich juice. • Always include some spices, especially in Winter, but always, spices are good. We juice a small, thin 1cm piece of ginger into all our green juices. You can also add cayenne pepper, cinnamon, tumeric, cloves, whatever you are feeling inspired to include. Here’s some words about foods/spices to ensure we include in our Winter diet. And be sure to check out the ORAC scale - the information in the ORAC scale about the anti-oxidant levels in foods that we so commonly over-look is quite amazing. • Juice what you can and then put the juice into the blender with fruits or vegetables that you want to drink whole; we often blend kale, kiwi fruit (how blessed we are to have the amazing local goodness of wild growing kiwi fruits!) and sometimes bananas (fresh or frozen) into our green juice. Blending is also a great way to add in your spices, you can even just blend the ginger into the juice. Be aware, with blending the ginger in, as opposed to juicing, gives a lot more ‘zing’ to the juice, so be mindful of how much ginger you use in this way! • If you do ‘juice’ as opposed to ‘blend’ stiffer leafy greens such as kale or cabbage, be sure to do so as single leaves and alternate with other produce such as a stick of celery or a wedge of apple – it’s kinder to your juicer, especially if you are using a slow juicer – they start to complain a little if you try to wedge through a whole handful of kale greens all at once! • Feed the dispelled pulp from the juicer to your chookeys - they’ll love you and you’ll be rewarded with golden, creamy yolk eggs from healthy ladies! • For optimal nutrient content from your juices – make and drink. 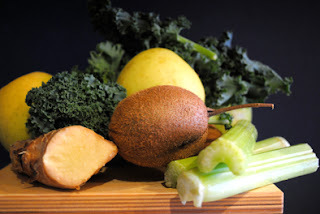 The juice will start to oxidize and deplete in nutrient content shortly after juicing. • Grow some wheat grass to include in your juices. It is super easy to grow and such a powerful, healing, cleansing, alkalising green food. The link above gives a great guide to growing the wheatgrass, although their beginning soak instructions seem lengthy. We have just been soaking the wheat-berries for 24 hours, drain, sprout for 24 hours then proceed as the linked instructions suggest. Be sure to ‘juice’ the wheatgrass as opposed to putting it into the juice via the blender. The human digestive system cannot digest grass, but the juice is extremely beneficial for our bodies. • If you want to add some extra protein to your juices, when you put your juice in the blender, add 1-2 scoops of rice protein powder, 1T of ground hemp seed (available from Gnostic Hemporium at Woy Woy), or 1T of chia seeds. There is a good comparison here between different varieties of protein powders. PS: If you would like to invest in a second fridge to hold all the extra produce you may go through in making up green smoothies and juices every day, but don't want either the high purchase or running costs, maybe you'd be interested in knowing what Maree has set up in her home. Maree and family are totally off the grid, relying on solar only for their electricity. To lessen the power used by the normal power-hungry fridges, they bought a cheap chest freezer and purchased a freezer-to-fridge conversion thermostat, here. Works perfectly, on very little power, and now they're thinking of purchasing another, to store all the fruit & vegies they go through! Are you throwing away the best part?